In my first book, The Restoration Economy (Berrett-Koehler, 2002), I described how the U.S. Army Corps of Engineers (USACE) had been waging war on nature since its birth over two centuries ago. 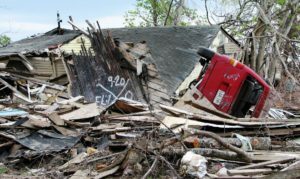 In the process, the Corps has inflicted far more economic and environmental damage on the United States than all the foreign militaries in all the wars we’ve ever been involved in, combined. Much of this was due to simple ignorance. 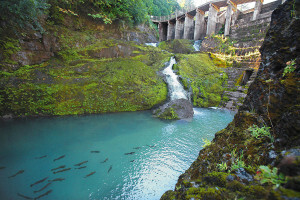 Chinook salmon being prevented from spawning by the Elwha Dam in Washington. 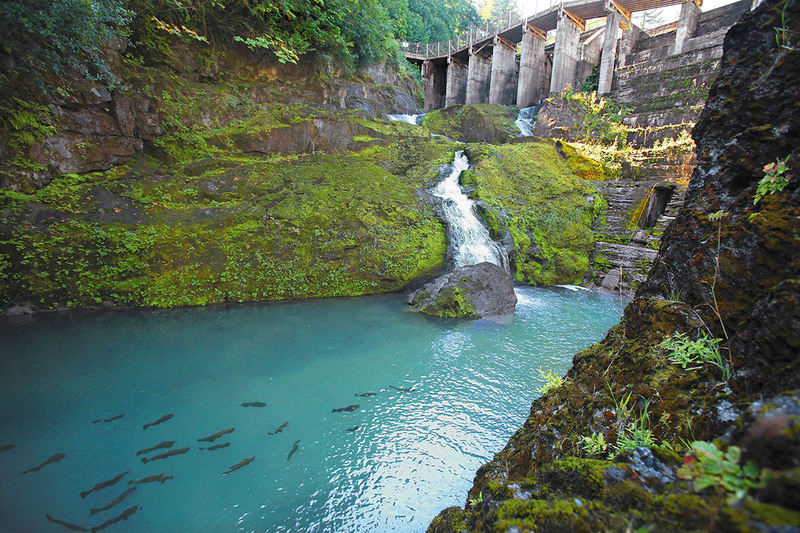 Both Elwha River dams have been removed, and the river is bursting with new life. But even after our understanding of ecosystems grew, the Corps continued in its efforts to stop water from flowing (or from flowing naturally) wherever they could. Part of this resistance to change is endemic to the engineering mentality: engineers fear surprises more than anything in the world. In fact, their discipline is primarily based on eliminating surprises. This is all well and good when we’re suspended 200 feet in the air on a bridge, or 200 feet under the surface in a tunnel. It’s not so good when we’re dealing with complex adaptive systems like swamps or cities. The ability to exhibit surprising behaviour is a defining characteristic of living (as opposed to mechanical) systems. Yet civil engineers have always been determined to make natural system behave like mechanical systems. But resistance to change isn’t the whole story. There’s also bureaucratic inertia and outright dumb policies. For many decades, the U.S. military (and most of the federal government) was plagued by a brainless budgetary system nicknamed “use it or lose it.” If they introduced better management procedures that enabled them to spend less to achieve the same outcome, they were punished by having their budgets reduce the following year. I experienced “use it or lose it” first-hand during my years with the U.S. Army’s 7th Special Forces Group at Fort Bragg, North Carolina. Once a year, our A-Team would head out to the firing range in a “Deuce and a Half” (6X6 M35 2½-ton cargo truck) loaded with leftover ammunition. We would spend hours firing handguns, rifles, submachine guns and machine guns until it was gone. We inevitably returned with blisters on our hands. As a result of “use it or lose it” budgets, the Corps built literally thousands of useless dams all across the nation. Migratory fish have thus been blocked from migrating, thus undermining virtually all of the country’s aquatic and terrestrial ecosystems. Billions of dollars of lost economic output every year has been the result, not to mention the extinction of hundreds of species. Little wonder then, that dam removal is such a fast-growing component of any enlightened region’s economic revitalization budget. 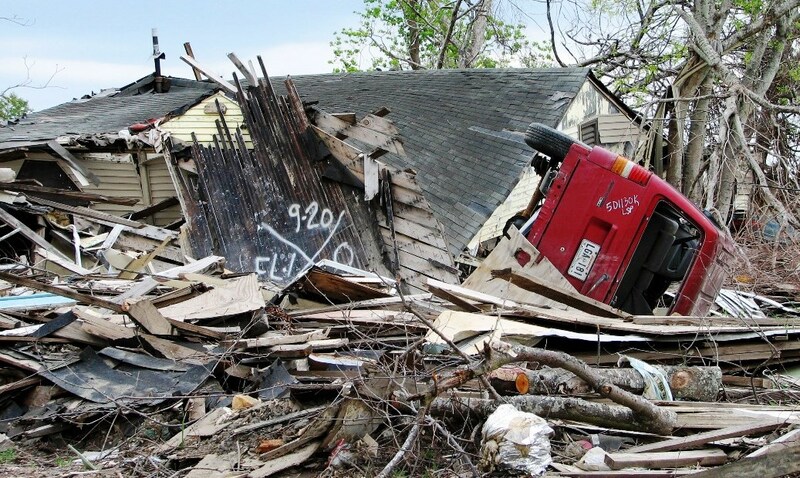 The Ninth Ward of New Orleans, which was devastated by a USACE levee failure. Of course, it’s not just wildlife or the economy that have suffered, as millions of folks in communities along the Mississippi River, the Missouri River and many other rivers can attest. They regularly suffer catastrophic flooding. 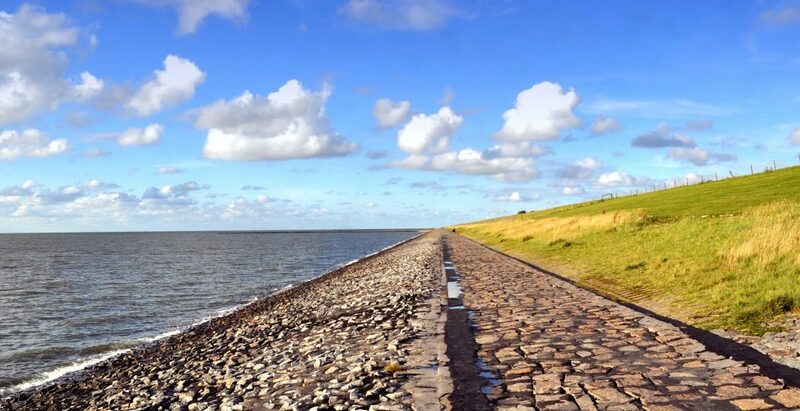 Sometimes it results from the failure of poorly designed and/or poorly-maintained levees. Other times, it’s from natural floods that are magnified because the levees prevent flood waters from being absorbed by floodplain wetlands. In The Restoration Economy, I also pointed out a very positive trend: the fastest-growing type of activity within the Corps at that time (and still today) was environmental restoration. 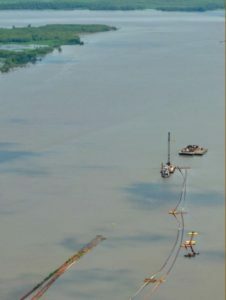 The book documented what was then a very new practice: beneficial reuse of dredge. 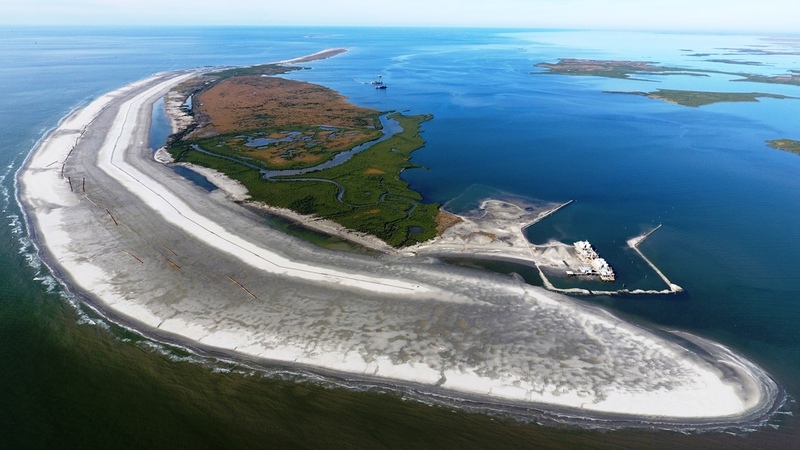 Here’s a recent article in REVITALIZATION about one such Corps project, which they did in partnership (another relatively new concept for them) with the Coastal protection and Restoration Authority (CPRA) of Louisiana. Evia Island, restored with dredged materials. Photo via USACE. For decades, the Corps had spent billions of dollars hauling dredged (often toxic) material from harbors and commercial waterways out to the open ocean. There, it was dumped, killing out vast expanses of coral reefs and shellfish beds by suffocating them. 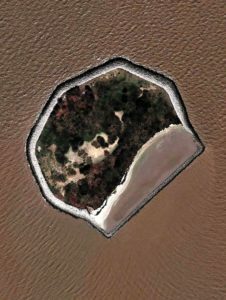 Finally, someone got the bright idea of using those dredged materials in the rapidly-growing practice of wetland and island restoration. Today, it comprises the largest and most successful form of restorative activity within the Corps. The switch from destruction to restoration came out the cost of more than a few careers. Old-timers saw restorative projects as a slap in the face, a repudiation of the Corps’ proud accomplishments. More than a few senior people (some of whom I knew personally)—military and civilian alike (most Corps employees ar civilians)—were forced out or passed over for promotion as a result of their early proselytizing for a greater institutional focus on restoration. Now, it finally seems that restoration is no longer seen by Corps culture as an abomination. The Corps has just published Engineering with Nature: An Atlas. While that statement will strike most readers of REVITALIZATION as childishly obvious, it’s truly revolutionary to hear it coming from the USACE. Granted, the Foreword wasn’t written by a civil engineer, but by Dr. Todd Bridges, an environmental scientist who leads the Corps’ Engineering with Nature (EWN) team. Calliou Lake Headlands (Whiskey Island Restoration) project, involving beneficial use of dredge. Photo via NOAA. “Over the last eight years, Bridges has quietly built the EWN initiative out of the Army Corps’ Vicksburg, Mississippi headquarters, working with a team of engineers, environmental scientists, and ecologists to develop pilot projects that prove the viability of engineering large-scale infrastructure in partnership with natural systems. 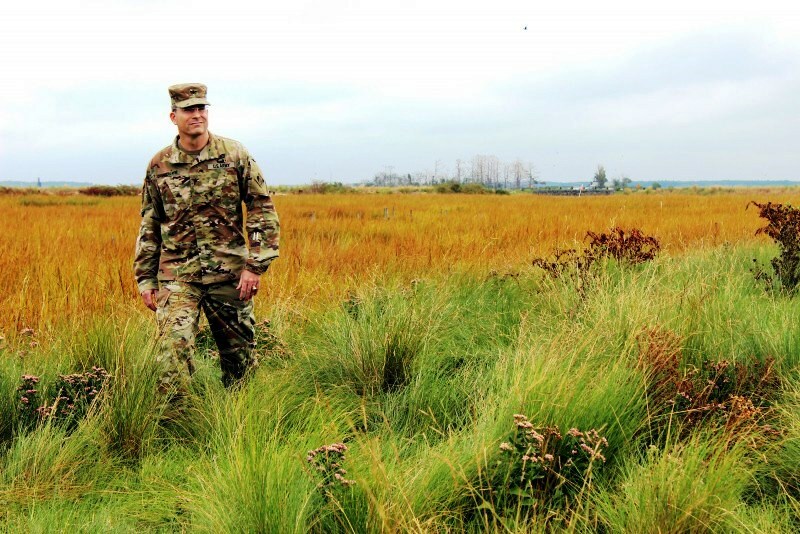 Col. Edward Chamberlayne, former commander of the Baltimore District of the USACE, walks through restored marsh grass on Poplar Island in 2016. Photo via USACE Baltimore District. 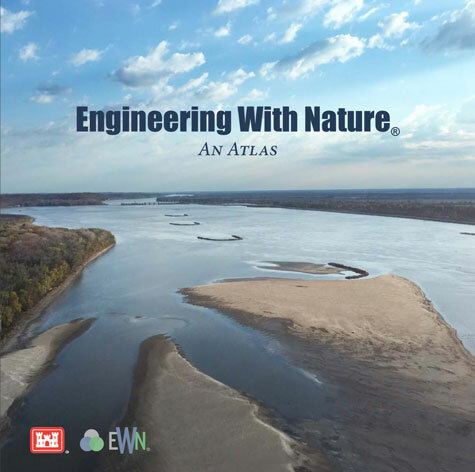 To that end, Engineering With Nature: An Atlas documents more than 50 engineering projects completed in recent decades that exemplify the EWN approach. No doubt, there are many enlightened former Corps employees—now either retired or in the private sector—who feel vindicated by this publication. Hats off to them, and to those still in the Corps who persevered throughout this long, painful transition. Unless otherwise credited, all photos are via Adobe Stock. See Andrew Wright’s full book review in The Dirt. See the Engineering With Nature: An Atlas website.